In November 1999 we had the last INSPIRE operations, consisting in the emission of signals at 10 and 1000 Hz. 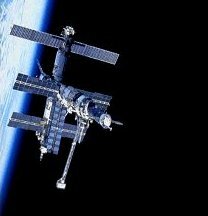 The Russian space station MIR will probably re-enter the atmosphere by first quarter of 2000. Two antennas have been used to monitor these emissions: a vertical, top-loaded Marconi 'Tee' for the vertical field and a large horizontal loop for the horizontal field. The arrow on a map show the receiving station position (my QTH). 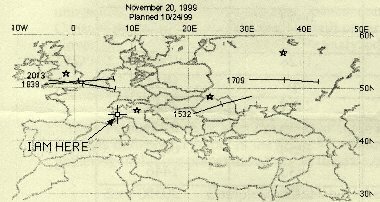 On all passes, MIR moves from west to east (left to right). The ground track shown is 2 minutes long which corresponds to the actual firing time of ISTOCHNIK. The passes are numbered with the UT start time on the dare indicated on the top of the map. On the track maps, the start time appears near the western end of the track. All the european passes has been monitored. repeat for 2 minutes of operation. On each pass, Ariel was either operated first or last, whichever gives the most coverage over INTMINS observers. Since the signal from ISTOCHNIK is more powerful, it was the one most likely to be detected. For that reason the schedule emphasizes the operation of ISTOCHNIK. For each session corresponding to a MIR pass four sonograms have been recorded, monitoring vertical and horizontal fields in the 0-86 Hz and 940-1122 Hz bands. The MIR emissions, lating two minutes, are approximately in the middle of each sonogram. All operations were automatic and pre-programmed to avoid operating errors. The large antennas used (Marconi 'Tee' 11 m high, 45 m wide; 120 m circumference loop, three turns) allowed a great sensitivity, demonstrated by the evidence of Schumann resonances in the vertical records. 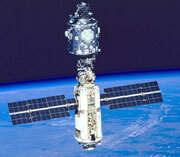 However no emissions from MIR were detected, even in direct over-head passages. My conclusion is that using the current setup, in terms of power to the electron beam, the signal strenght is insufficient to allow reception at ground. Probably the noise power present is by far too large, or the ionosphere screening factor is very high at those ULF/ELF frequencies.